more than fifty years electric guitars. 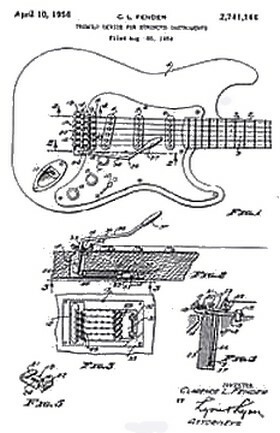 The patent of the revolutionary tremolo-system of the Stratocaster. 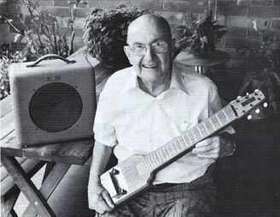 Clarence Leonidas (Leo) Fender was born on 10 August 1909 in Anaheim, California. Leo Fender is the probable most influential producer/designer in history of the electric guitar. As talented elektro-technical expert and driven researcher he has a clear view on the manner on which particular things work. He value self that there are 50a to 75 patents on his name. Between 1930 and 1947, Leo had a small store for radio repairs and he delivered by order amplifiers and PA systems to musicians. Most of its customers were steelguitarists, who often to complain about defects on existing pickups. Leo had put already improvements on for automatic record player changers and now he decided to design better pickups and amplifiers. Already soon he wanted to build steelguitars and about 1944, he began to experiment with an electric, Spanish solid-body guitar. He used for this the pickup of his steelguitar. This prototype was rented to country & western groups, of which the musicians Leo exhorted to develop the instrument further and in take it in production. Leo directed together with Doc Kauffman, an ex-employee of Adolf Rickenbacker (that who owned the same name guitar firm), the firm K.& F. K. & F. made steelguitars and various amplifiers. Some famous amplifiers manufactured by Fender, Champ, Blackface Priceton and the Blond Twin. Kauffman left the company in 1944 and after that the Fender Electric Instruments Co. as set up, that consisted of Leo and six assistants. The sale was in hands of Pacific Music Supply, Francis Hall and various rural organizations that occupied with the giving of steelguitar lesson. Meanwhile Leo had fifteen men in service. The company moved to a factory by 1200m² that expanded became in 1949 again till 1800m². In 1953, they went over to a factory of a small 7000m². Leo grounded also an own distribution organization, Fender Sales Inc. under leadership of Donald D. Randall, now the owner of Randall instruments Inc. In 1955 there were 55 employees in service, a number that in five year grew up to 135. In 1959 new buildings were build, and in 1960 2000m² extra floor surface was leased. 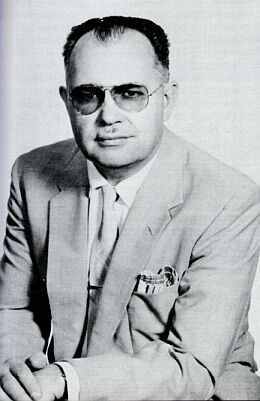 "Henry Ford of the guitar"
IInitially Leo Fender was head-technical expert, administrator and only owner of the whole company. Two of its assistants, Freddie Tavares and George Fullerton who were not only competent technical experts and musicians but have also an important contribution furnished at Fenders worldwide popularity. Fender is expanded until one of the two companys (the others is Gibson) that is markt leader in the world of professional electric guitars. In 1948, leo devised an instrument that the face of music just well would change. This work horse is one of the most popular electric guitars. Although the guitar is relative cheap, it's got a long life and the fierce, smarting sound is very much recognizabler. The Telecaster is have stand especially popular by country and rockmusicians, but even jazz-guitarists have there for them rock-sessions in the studio one in the cupboard. The Telecaster, that original Broadcaster was named, was invented by Leo Fender and introduced in 1948. The reason of this name modification was the fact that Gretsch had drumkit with the name Broadkaster. For a short time the guitar was released without a name, only the name Fender was enough. These guitars are now called 'no-casters' and very wanted at collectors. In 2003 Gretsch taken over by Fender and came back 'Broadcaster' on a special series Telecasters. The body had been made from ashwood, while the removable neck from one piece of harden rosewood existed. The first Broadcasters had no attachment beam and are to recognize at the fact that they have no elongated dark strip at the back at the neck This dark strip of wood becomes uses to fill up the deep groove, after the iron pin in the neck is been assembled. Fred Gretch had uses the name Broadcaster already for one of his drums. Although Leo Fender court certain knew that he by a possible conflict the name certainly would be able to handle, changed he it in Telecaster, also in connection with the beginning popularity of the television. In those days the first Telecasters costs around $ 189.00. They were identical to the Broadcaster and became uses especially by country & western-giutarists. The sound could be regulated by a three-positions switch, which you the 'first-pickup' at the bridge (first position), the bas pickup (mid position), or the same bas pickup by a condensator (back position) could turn on. This last position makes a droning sound, that was suitable for the playing of bass riddles. When switching in one position to the others, changed also the volume, what makes it sometimes necessarily to fit this by the volume button..
After the invention of the basgiutar the low droning sound became unnecessarily. A disadvantage was that one they not could the two pickups to combine on the old models; and therefore are there in the middle of the years fifty changes put in, that had to see to for a biger choice at institutions: the slice solo-pickup, both pickups and the bass-pickup. After a few year, the copper bridge became to replaced in chromed steel and at the end of the years sixty, the resistance of the volume was changed by 250 Kilos ohm in 1 Mega ohm. In early 1955 there various changes were put in: the black bakelite plate from one pieces wanted to replace for a white plastic, the cupola form tone and volume button became flat and the transparent lacquer became less transparently, so the wood structure was no longer visible. On guitars beforer end 1954 the series numbers are at the front near the treble-pickup to see, while the neck affirmations plate is blank; after this period they pressed the series number on the neck affirmations plate. Fender started applying serial numbers in 1950. More information about Fender serial numbers and dating. Also about 1954 they changed the ovals plate over the pickups selector in the four angular plate that put it in still on. Except of the well-known standard Telecaster there exist there also deviant models, like: The Esquire, introduced in 1954, a Telecaster without bass-pickup and after 1969 taken out of production. The Thin Line from in the middle of years sixty, with at one side hollow and with one F-hole. In 1972 on the Thin, two humbuckers were assembled. The Telecaster Custom from March 1970, with a humbucker as bass-pickup. The Rosewood Tele (1969, 1970, 1972). And the Tele Deluxe from 1973, a new guitar with a rounded body, two humbuckers and new frets and neck so the strings come a littlebit closer to each other. The decorative finishing off with feather and flower motives were only available in 1969. From 1959 until 1969 became the Telecaster and the Esquire furnished in a standard-finishing off (custom- finish), that means sunburst with a white bond at the edges. After 1969, the term Telecaster Custom refers at to a new guitar with humbuckers. The Stratocaster has been developed in the early fifties and was introduced is in the spring of 1954 and developed till the most popular and copied guitar in the world. Under rock-musicians, the Stratocaster is certain one of the most pleased guitars. Probably also thanks her modern appearance, it is the only guitar with three pickups, that becomes sold on large scale. Through the skilful tremolo that has been designed by Leo Fender himself, knows the Stratocaster in the hardrock scene her way to find. Just like all present Fenders, were also Stratocasterbodies these days made with ashwood. There were in the in the beginning three persons, that actual as founders of the 'Strat' are commented; Leo Fender, Freddie Tavares and Bill Carson did contributed a particular contribution at the guitar design. 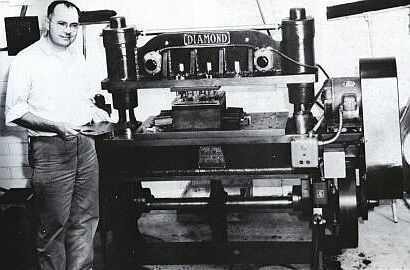 Freddie Tavares and Leo were started in 1953 the designing until 1954, when the first became sold. They wanted something news, something particular, something that never one yet had seen on guitar territory. They had already from the beginning the idea to build a guitar with three pickups. Point of departure was to design a good sounding and playing guitar, foresee of a tremolo-arm. This last also to beat the competition with the firm Bigsby. These had already guitars with tremolo on the market that became good sold. Fender's first models of the Stratocaster, including with tremolo, became sold for $249.50. Through the adapted form of the body, the guitar lay much more comfortably against the body of a guitarist than the ponderous Telecaster. Solid rosewood necks were standard until 1959; in 1960 came on it a purple wood fretboard. In 1970, the customer could want to get on request ashwood necks. The guitars, that released before the middle of 1966, have a something narrower head then the present Stratocasters. Tavares designed the head (an example of his talent practically use combine with beauty) where all Fenders, with exception of the Telecaster, now have been equipped. 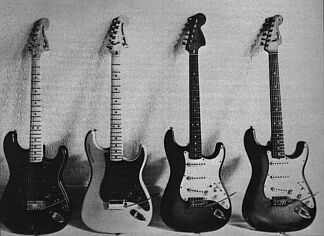 The very first Stratocasters had a plate of thick white plastic, of one pieces, but from 1959 all Stratocasters been forsee of a laminated/black/white plate. In 1959 there also single models wich have a anodised gold plate. Original old Strats had a bones nut (these days of ABS-plastic), while the manner of finishing off various times has been changed. Old strings holders, that named by Fendertechnicions inertia blocks, had been made of steel; the present are of pig iron. The three pickups of the Stratocaster can separate switched; that the selected-switch also can set between two positions, so that two pickups the sound catch, is a pleasant accessory that not conscious so by Leo and Freddie has been designed. This combination of two pickups produce a sound that does think of a from-phase tuning. 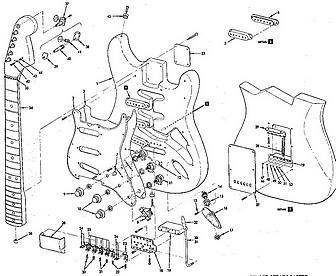 From 1972, the Strato- and Telecasters are foresee of humbuckers pickups with a minimal angle-adaptation. Because of this you can the angle of the neck to respect of the body adjust with a little spanner that justest in a hole in the affirmations plate at the back of the body. By an identical construction just above the nut, you can also separately to adjust the neck by tighter or unbend the the iron pin. Countlesses guitarists, include many famous names, made the Fender Stratocaster to their daily tool. With that they already formed a legend around this instrument, long before there was talking about a successor. 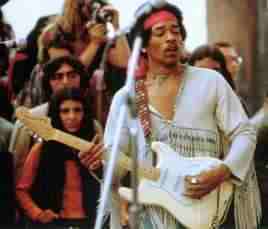 The most famouse Stratocaster player perhaps was been the magician Jimi Hendrix. In his hands appeared the Stratocaster sometimes to lead an own life and rarely will someone produced such impressive series sounds and effects from one instrument. Pure magic. Hendrix concerned the show-pupil of Fender perhapsthe greatest fame whwn hey olayed there in 1969 on Woodstock his version of the American national anthem, as a protest against the war in Vietnam.. This Stratocaster, the 'Olympic White' from 1968 in 1993 furrow a million dollar is sold and came later for an unknown sum, but sure higher, in hands of Microsoft miljardair Paul Allan. The expensivest guitar ever? Also Hank Marvin not may become forget. He played on indeed also guitars of other make, among which instruments that carried his its own name, but the characterizing Shadows- sound arose really with help of the Stratocaster. Further also in this line up of Strato guitarists; Ritchie Blackmore, Rory Galagher, Robin Trower, Eric Clapton, Mark Knopfler, Robin Robinson, Bob Dylan and George Harrison. They are only single of the many big and less legendary fames that gave the Fender Stratocaster his unique position in the world of the popular music. Often the Stratocaster in one breath named with the Gibson Les Paul, but with their totally different character these two can't real competitors of each other. A beautiful example of this is to be heard in Mike Oldfield's, Moonlight Shadow which the Strat. and the Les Paul are in a duet. The characteristic sound and the timeless design make the Stratocaster a lasting trends and many beginning guitarist dreams about it, ever to can play a real Stratocaster. The Stratocaster is particular popular and becomes sold sometimes better then the Telecaster. And that, while the design since his introduction in 1954 in principle scarcely have been changed. Also the younger generations go with it at the blow. It is so simple to replace a pickup or bring changes at it that you can the stratocaster totally at your own taste adapt. Besides it is the most imitated guitar to world. Special models have been praised especially: At the 'Strat 50th Anniversary Masterbuild' has a price ticket of a small six thousand Dollar. It is an exact replica of the Stratocaster from 1954. To occasion of the fiftieth birthday of the Strat rebuilt the Custom Shop of Fender also 'Number One', the Stratocaster of late Stevie Ray Vaughan. Fender has of course also other solid-bodies in their assortment. In 1956, the Duo-Sonic and the Musicmaster were introduced and renewed in 1964. The Duo-Sonic has been taken out of production after 1969. End 1957 was shown the Jazzmaster to the world. The first models had a narrow head, a anodised aluminum plate, black pickup caps and chromed cilinder formed buttons. The exemplarily that released end 1959, had also a metal plate, but white buttons and white pickup caps. After the introduction of the Telecaster in 1950 and the Stratocaster in 1954 want Leo Fender in 1957 a new model guitar. It was the Jazzmaster, a yet further ripened and well considered design. Although it perhaps strangely appears, is the sound of the Jazzmaster not many differing of that of the Stratocaster. This basgitaar changed the sound of the popular music! 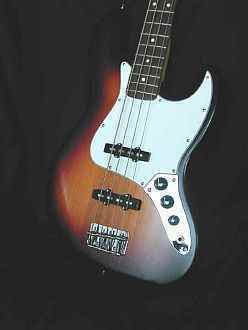 Leo Fender recognized the need at an instrument that the difficult to handle double-bass had to replace and developed therefore the electric bass, that he named Precision. The price at that time for a precision bass was $159.50. The advantages to respect of the 'dog-kennel', as Leo the double-bass named, was conspicuously. She is smaller and sounds much louder. Also bass players can now with a mensurelength of 85cm get on well with it. An other big advantage is that the bass players can play the tone more accurate - so the name Precision Bass - , because the instrument is foresee of frets. The popular music industry was down on it like a flash. Although various manufacturers had identical bass guitars, became every electric bass guitar named 'Fender bass' named, even it was one other brand. The Precision bass is by far still the most used bass guitar. Te first models that released in 1959 looked by nearly the same from as the later on Telecaster bass guitars. Single months after the Stratocaster was born (1954), got the body the form that she has these days yet. The Telecaster plate, that the entire top part of the body covered, remained however maintained, while also the head yet was by the type Telecaster. The buttons had been housed in a separate metal part. In 1957, the head got his present form, the well known pickup replaced the old single spool and came the present plate that also round the buttons instead the old one. The plate had been made by anodised aluminum, but in 1960, one went over on plastic. Until 1959 were ashwood necks standard and from 1969 were this only deliverable on order. The Telecaster-bass guitar appeared in 1968, and look alike the very first Precision. 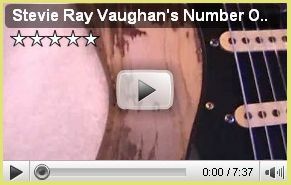 In February 1972 a large humbucker pickup was put on and were done more various changes. A variant on the Precision forms the fretless exemplarily from 1970 that originally had been intended for double-bass players but these days also be played by many bass guitarists. The sound of this fretless bass is sweeter then that of the usual bass guitar and fiercer than that of the double-bass. The perfect intonation is on a fretless bass more important than on an usual, because not the fret the string delimits but the finger, so that by a minimal shift the tone already inaccurately becomes. One advantages is that you can play on the fretless bass also a quarter or yet smaller distances. Also the sound is to be manipulated exists better with the fingers, because there is a more direct contact with the string. The jazz bass appeared in 1960 and had a body, that looked like the Jazz-master, new pickups and a narrower neck (more than 3.5 cm). In 1966 she got a tied neck and a fretboard with rectangular position sign. In 1962, Fender began the producing of acoustic guitars. The Kingman, Concert, Shenandoah, Villager, Newporter, Malibu and Palomino being part of the first series. The Wildwood-series had a back and sides of colored wood with whirl year ring. These were built from 1966 till 1969. After that the semi-acoustic Coronado and Antigua followed. 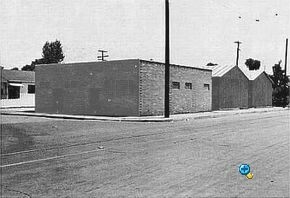 When Leo Fender at the end of 1964 for reason of healths stoped working, he decided to sell his factory. For thirteen million dollars, the company in 1965 went over in hands of CBS, what made by a lot of guitarists awful agitation. The indication pré-CBS has for many the magic sound that does suppose, that everything after is built, is actual no real Fender. That rumors are not without reasons of course, and it is a fact that the CBS Company committed especially in the beginning was making several blunders. For example, they stopped had to plunge the pickups in wax. Originally became that done to prevent unwanted resonations and accoustical feedback. That they not could just stoped that process pale already shortly from the series complaints about the sound of the guitars. At the end of the sixtys introduced transistor amplifiers never became a success disappeared from the program. Opposite this everything must be say, that the constant quality of Fender till Fender, after the take-over purchase strengthen has been improved and what we also not may forget is that by the efforts of CBS the Fender guitars for a much biger public accessible became. Changes at the Stratocaster for instance were there direct after the take-over purchase scarcely. Since CBS was the F from the Fender logo smashed in the metal plate for the neck affirmation. Fender produce not only guitars but also amplifiers, pianos and mouth organs. 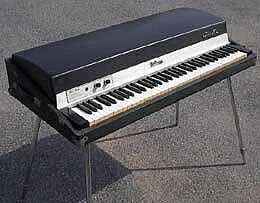 In the years '60 introduced Leo Fender the Rhodes piano. This instrument would have a tremendous impact in the music world. Although the original design had been meant the acoustic piano by rockconcerts to replace because the heavy weight which one always had to drag, went the Rhodes lead an entire own life thanks to his unique sound. Supertramp developed an own and unmistakable style thank this instrument. Also 10cc (I' m Not In Love) made million sellers with the Fender Rhodes as sound modifying instrument. After Leo had sold his company to CBS in 1965, he founded a new company CLF Research in 1966, with which he continued to support CBS with advice until 1970. From 1971 Leo worked together with Forrest White and Tom Walker, both old Leo employees from the Fender era and founders of the Music Man company in 1971. In 1976 the first models designed by Leo and Forrest came out, including the StingRay Bass. At the end of the seventies Leo stopped his CLF Research as a consultancy for CBS/Fender. He designed and produced original Music Man instruments for a while but was looking forward to the launch for a new brand. In 1980 it was time, along with George Fullerton (again an old employee from the first hour) the company and brand G&L was established. In 1991 G&L was taken over by the audio technology company BBE Sound. The latest development atj Fender is the surfguitar. In association with Intel Fender created an electric guitar with built in a wireless internet access. The guitar has been based on the famous Telecaster model, TELE v1.0. In the body of this guitar a computer is incorporated which uses of the Intel Centrino mobile technology, with a screen on the back. Built in software means you can access a massive variety of sounds directly from the computer. You can download riffs of the Internet and play without even touching a string. With the 'surfguitar' you can make digital recordings and these forward directly to e.c. the recording studio or to another ' surfguitar '. Also multi track recording on this guitar is posible. And of course there is a e-mailing facility and even a webcam is not lacking on the guitar. If this now really is an inovation of the guitar or just a gag, the opinions concerning this new development strongly diverge under the guitar players. To the most creative spirits of them probably will ignore this instrument. 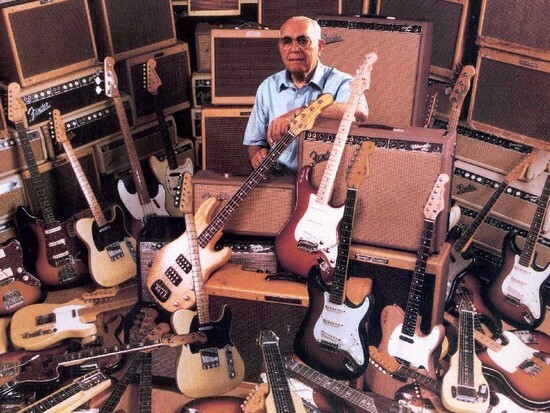 Leo Fender died 21 March, 1991 on a age of 82.
of his guitars will eternal remain live on.